With a project like easy crochet mittens, even the novice can make an excellent product to give to family and friends or to sell online at a craft website. Mittens are a go-to project for many people who like to crochet, especially around wintertime when last year's pairs of gloves and mittens become mismatched or get lost. Best of all, crocheted mittens can be made to fit just about any style and color scheme. Whether you are just learning to crochet or already skilled at the craft, try making a pair of easy crochet mittens this winter. 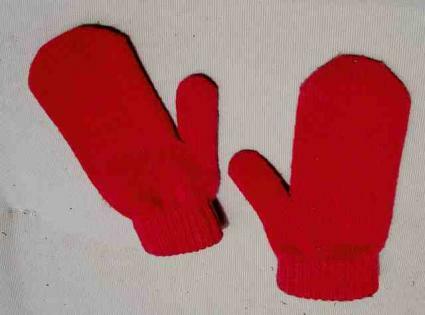 It doesn't take much time, effort, or money to create a fantastic pair of mittens that anyone would love. Begin your project with one or two skeins of worsted weight wool. If you like, you can include multiple colors, but a simple design calls for only one. A size G hook will work well for this simple project, but other sizes work as well depending on the style that you've developed. If you're a novice, stick to the size G hook. You will also need a chart or list of how to make each stitch. Many websites use abbreviations common to the trade, such as "ch" for a chain and "sc" for a single crochet when making such lists and charts. While such a chart or list will certainly be useful, as long as you know what each stitch is and how to form it, you won't need to refer to the abbreviations for this particular project. Make sure you have a stitch marker handy and you are ready to begin. Chain four and join with a slip stitch. This will form a ring, which will provide the basis to create your mittens. Place a stitch marker, and work seven single crochets into a ring. Join these together with another slip stitch. In the second round, work two single crochets in each single crochet you have made. Join them together with a slip stitch. Do the same for round three, for a total of 28 slip stitches in the round. Work in even single crochets without joining with a slip stitch until the top of the mitten measures around six inches, and end your row at the stitch marker. At this point, you will be able to create the thumb opening. Chain together, skip the next six stitches, and then use a single crochet until you reach the end of the chain, using a single crochet in each chain. Even rounds should be worked in over the next few inches, depending on how large you would like the opening to be. Connect the yarn of the thumb piece with a single crochet stitch, and continue around until you have about 14 stitches in total. These will be joined with a crocheted slip stitch, and then you will work in even single crochets (do not join the rounds) until the thumb piece is at least an inch long. Decrease the next two stitches, and over the following three inches, work them until they are even. Leave a tail long enough to be able to shut the ends, and cut the yarn and thread the thumb until it is closed. Chain 16 together in order to begin forming the cuff or short sleeve of the crocheted mitten. Single crochet the second chain, and then do the same in each chain. Once you reach the bottom of the hand part of the mitten, single crochet the next two, skip the ones you've just made, and then single crochet each stitch in the following row. Work in the back loops. This will create an "elastic" ribbing which will continue down the cuff. Leave a tail after you've made the cuff as long as you please, and thread together the first and last rows to create the cuff. Once you have made your crocheted mittens, you can move on to other projects, including a crochet hat to match. Learning how to crochet your own accessories can provide you with a level of fashion freedom that few enjoy and these easy crochet mittens are a great first step.